October 17, 2016, 10:43 a.m. In the age of social media, how we are seen by others has taken on a heightened level of importance to many people’s identity. Obsession with getting the right selfie, with the right filter, with as many likes as possible, is a key affirmation of people’s popularity and how they think of themselves. Impressions given by social media can only go so far, of course, and tend towards favouring people’s more superficial characteristics. But, deep down, how do we really want the people we know to think of us? New research from YouGov can now reveal the characteristics British people would most and least like to be described as having. Being “honest” is the most popular word people would like to be described as, with nearly half of people (49%) choosing this option. Also popular were “friendly” (43%) and “kind” and “loyal” (38% each). As for what people would least like to be described as, being “nasty” and “a liar” came joint at the top of people’s lists at 40%. People were also keen to avoid being described as “selfish” or “stupid” at 32% each. However, there can be big differences in the words we would like and dislike to be called depending on our age, our gender and social class. Women, for instance, are particularly keen to be considered “kind” when compared to men. Almost half of women (47%) would like be seen as kind, a full 19 points more than the number of men. Middle class people are much more likely to want to be described as “intelligent” than working class people (40% vs 26%). Being seen as intelligent is the third highest priority for middle class people – behind being seen as honest and friendly – whereas for working class people this is a mid-level consideration, placing seventh out of 15 characteristics. Looking at how the way people want others to think of them reveals a fascinating shift from concerns about appearance to concerns about character. The older a person gets, the more keen they are to be seen as “honest” and “loyal”, whilst becoming less concerned about being seen as “funny” and “attractive”. 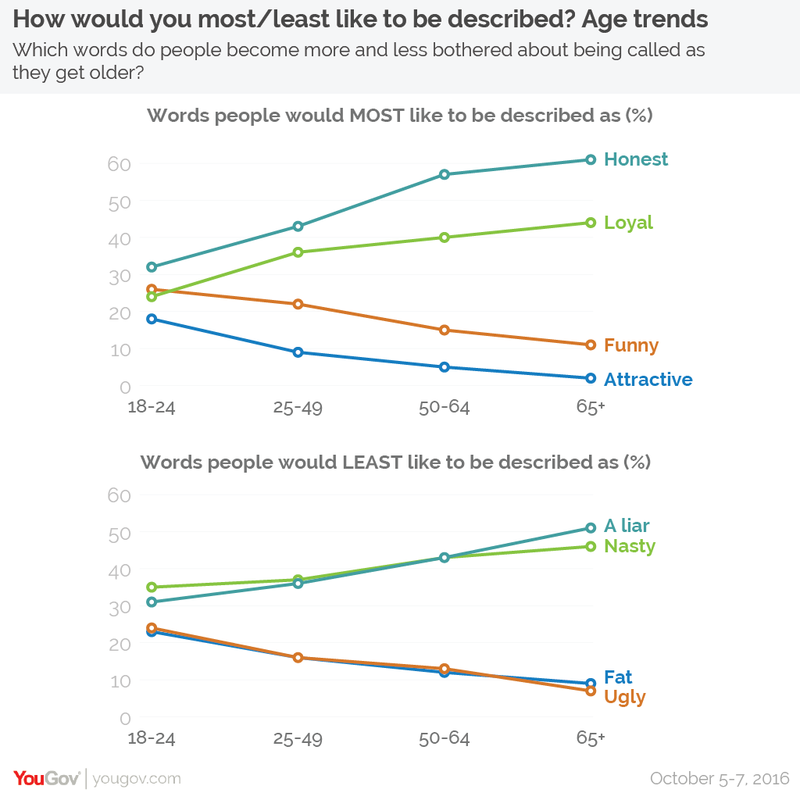 In terms of the words they don’t want to be called, the older people get the more likely they are to avoid being called “nasty” or “a liar”, whilst becoming less bothered about being called “ugly” or “fat”.